HM Revenue & Customs (HMRC) has produced a great set of webinars to help customers to understand a variety of tax systems and learn what obligations they need to meet. Both live and pre-recorded options are available. Live HMRC webinars last for an hour and are interactive, giving you the valuable opportunity to ask questions directly to the webinar host. The webinars are available on set dates at set times – we have listed them all below for you, and will update this post regularly with the latest webinar schedules. You will need to register in advance for a live webinar by clicking the relevant link below. The session is then recorded and made available to view after the event. Registering for a webinar is really quick and easy – simply provide your name and email address. You will then receive an email with a link to view the webinar at the date and time you have chosen. Tip: make sure you log in at least 5 minutes before the start time to ensure you have time to download the Citrix GoToMeeting software needed for the HMRC webinars. You don’t need to register for the pre-recorded HMRC webinars. Although they are available to view instantly, they are not interactive, so you cannot ask questions. 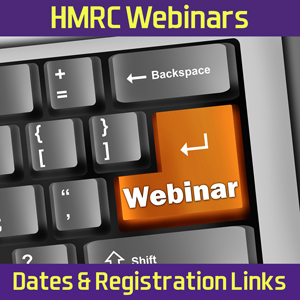 We have posted links to the pre-recorded HMRC webinars below. Some of them are shorter YouTube videos and therefore don’t necessarily contain all of the content that is presented in the 1 hour live webinars. This HMRC webinar concentrates on the information sole traders or partnerships need when they start. It covers Registration, National Insurance, Self-Assessment and Record Keeping. You will also have chance to ask the presenter your own questions. This HMRC webinar is suitable for the self-employed or those perhaps thinking about going self-employed. Find out about key aspects of record keeping such as setting up a record keeping system, what to record and how long to keep records. It lasts for one hour and there will also be the opportunity to ask the presenter questions. Find out about allowable expenditure including, motor expenses, working from home and what happens when you use something privately and for business. This HMRC webinar is aimed at people who are either newly self-employed or perhaps thinking about going self-employed. There will also be the opportunity to ask the presenter questions. Find out how to claim tax relief and see examples of calculations for the cost of buying or improving items such as vans, cars and equipment that you use in your business. It lasts for one hour and we will show you the different types of Capital Allowances available and some practical examples. Capital Allowances are tax allowances that can be claimed when you buy items of equipment and are self-employed. How to complete your online Tax Return and find out how to register for Self Assessment Online, how to tailor your Tax Return, how to complete the self-employed pages and how to send your completed return online. This HMRC webinar is aimed at sole traders and is not suitable for directors of limited companies. Find out what cash basis is, how it works and who can use it. This HMRC webinar will also cover simplified expenses and the appropriate records required. simplified expenses and the appropriate records required. This webinar is aimed at Sole Traders and Ordinary Partnerships and is not suitable for directors of limited companies. For new and prospective company directors, gives new directors an overview of their responsibilities to Companies House and HMRC. This HMRC webinar is aimed at new and prospective company directors. This HMRC webinar is aimed at VAT-registered businesses or those that are about to register. It explains what VAT is and how it works, when you can and should register and what you must do after you register. This HMRC webinar is aimed at VAT-registered businesses. For some small businesses accounting for VAT could be a big part of your operations. So it would be helpful to know about the different schemes available as choosing a suitable one could save you time and effort. This HMRC webinar explains how you deal with the VAT obligations of motoring expenses. An explanation how you deal with the VAT obligations of motoring expenses, including VAT on cars and commercial vehicles as well as maintenance and repair issues and fuel costs. This webinar is suitable for VAT registered businesses or those who are likely to become VAT registered. Whether you run your business as a sole trader, partnership or limited company the webinar, covers all aspects of record keeping. This HMRC webinar gives an introduction to record keeping for all businesses. whether they are a sole trader, partnership or limited company. It also covers VAT registered businesses, employers, and those working within the Construction Industry Scheme.